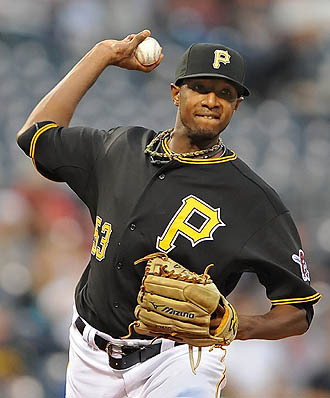 Pitcher James McDonald, necklaces dangling, had his best start as a Pirate, pitching seven shutout innings to help the Bucs knock Atlanta out of first place in a 5-0 win last night at PNC Park. Would it be wrong to call this one regular season win revenge for both the 1991 and 1992 playoffs? McDonald limited the outgoing Bobby Cox's team to five hits before giving way to the Pirate bullpen, where Evan Meek and Joel Hanrahan threw two innings of nearly perfect baseball, allowing only a walk between the two of them. The game was scoreless until the Pirates broke it open in the seventh, when Garrett Jones doubled, Pedro Alvarez drove in Jones, and Ronny Cedeno then drove in Alvarez and Ryan Doumit with a bases-clearing triple. Delwyn Young finished the Braves off with a two-out, pinch-hit home run, scoring Cedeno. The fact that four of those five runs were credited to Atlanta ace Tim Hudson (15-7, 2.41 on the season) was even more jaw-dropping for Bucco fans. But the Pirates have actually beaten some very good pitchers this year, including Johan Santana, Roy Halladay, Adam Wainwright, and Roy Oswalt, so I can't say I'm completely surprised. They have an odd way of finding an acorn as the blind squirrels of Major League Baseball. Hudson aside, McDonald was the story in this one, working out of jams and getting a Derrek Lee double-play to stop a bases-loaded threat the Braves posed in the sixth. It was a much-needed confidence boost for McDonald, who had given up 14 earned runs in 16 1/3 innings in losing his last three starts. And the presence of the opposing pitcher did serve as motivation. Said the 25-year-old about beating Hudson: "You know you've got to bring it against a guy like that. He might be the best pitcher in the league right now." If you can believe this, the Pirates go for the sweep tonight against the Braves, but it will be a tall task. Zach Duke will be pitted against Derek Lowe, who owns a 9-0 lifetime record against the Bucs. Gametime is set for 7:10 at PNC. Haha, no comments about the battlin' buccos. Sad sad stuff. Maybe they can put together a streak to aboid epically bad and only lose 110 this year? That bein said, they look to have some decent pieces to play with next season. If they can get 4 decent starters out of J. McDonald/Duke/Maholm/Ohlie/Hot Rod Lincoln/Great Stuff Morton/No Relation McCutchen/J. Martinez ... Wait a minute, should the fact that next season's starting rotation is THAT unsettled be scary? Yes, yes it should. Four hours and no wise cracks about trading him? J-Mac has been better than his numbers show with the Bucs. It was good to see him get good defense behind him for once. I'm looking forward to seeing him be a mainstay in the rotation going forward as a solid starter. At worst, he can be an effective set-up guy out of the pen. Getting him alone for Dotel was worth it and it'll be highway robbery if Lambo develops. James McDonald: I'm lovin' it. Seriously, I hope the Dodgers like Octavio Dotel. It's just too bad all the best pitchers in the Pirates' system are about 3+ years away from the Majors. I'd love to see a good rotation develop alongside the McCutchen/Walker/Tabata/Alvarez core. By 2012 the rotation shouldn't be an embarrassment with Rudy Owens, Jeff Locke and maybe Bryan Morris taking the place of Duke, Maholm and the motley crew of organization depth pitchers we've been putting in the 5-spot. If either Brad Lincoln or Charlie Morton could find a way to stop sucking, they could make up a pretty decent rotation.